Peter Bawuah was born and raised in Ghana, West Africa. 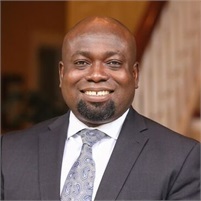 He has a Bachelor’s degree in Economics from Kwame Nkrumah University of Science and Technology (KNUST), Ghana; and a Master’s degree in Finance from Delaware State University. Peter is a CFA and his Series 6, 7 and 63 securities registrations with LPL Financial. Peter began his Financial Services career in London, UK in 2002 with a local regional firm. He relocated to Delaware in 2004 and has worked with a number of large multinational financial institutions in the Delaware and Maryland areas. In February 2012, after gaining extensive experience and knowledge in a variety of roles in the industry, he joined the Covenant team. Peter and his wife Leslie live in Middletown, Delaware with their daughter Zhane. Peter enjoys reading, movies, racquetball, golf and spending time with his family.